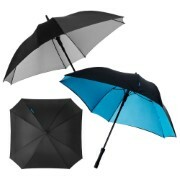 Automatic opening exclusive design black and blue umbrella with fibreglass ribs and shaft, packed in a non woven Marksman gift pouch. Available in 2 colours. We would love to help you with a custom quote. Mention NOTTAGE-MM1018BL. Just call 1800 674 722 or get a custom quote.